Sadly, your Maximum Leader can’t find a non-rights protected copy of it anywhere to post. It is a wonderful song. Take his word for it. Greetings, loyal minions. Your Maximum Leader saw this piece by John Yoo on Ricochet and felt like sharing: Pirates: Still the Enemy of All Mankind. By the way, if you haven’t seen The Wind and the Lion, it is worth your time. Greetings, loyal minions. 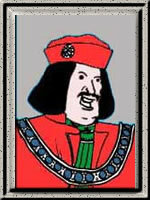 Your Maximum Leader asks that you remember Richard III, King of England. He was killed in battle at Bosworth this day in 1485. He fought valiantly, if not triumphantly. He was the last Plantagenet to rule England. He was the last King of England to die in battle. And his death marks the generally accepted end of both the Wars of the Roses and the medieval period in England. Richard is, in your Maximum Leader’s opinion, one of the most maligned kings in all history. Shakespeare’s play, while vastly entertaining, is far from an accurate portrayal of history and the man as we now know him. But that is the subject of another post. To close, allow your Maximum Leader to post an obituary first penned by Rex Stout. While your Maximum Leader would not lump Shakespeare in with the knaves, Richard’s memory has certainly been besmerched by many. Greetings, loyal minions. Your Maximum Leader has no political capital to expend so his suddenly wading in from the sidelines on the “Ground Zero Mosque” is only slightly less interesting than President Obama wading in suddenly from the sidelines on the same issue. By now, unless you live under a rock, you have heard that a group wants to put a mosque in a building a few blocks away from the World Trade Center site. There are two questions at the heart of the mosque issue. The first question is can a mosque be built near the site of the World Trade Center attacks? The second question is do people want a mosque built near the site of the World Trade Center attacks? The first question, the rarely asked question, in this discussion is so very important and so constantly overlooked that it makes most of the people on both sides of this “debate” seem like drooling idiots. Can the mosque be located in the building in question? So long as local zoning laws and building codes are followed it can. Of course it can. There is no legal reason why you can’t put a mosque in that building. It was the this first question that President Obama was trying to address in his remarks on the subject recently. Now let your Maximum Leader go on the record and say that he wonders why the hell the President would inject himself into this “debate.” It is a loser all around for him. It makes no sense, from a political perspective, to comment on this issue. Sure my liberal friends can say “He needed to use the bully pulpit to do the right thing.” Yeah, your Maximum Leader can see that. But in this case doing the “right thing” diminishes the President’s ability to do the right thing later. He is spending political capital (that he is losing at a rapid rate) on an issue that so inflames peoples sensibilities that there is no possibility of coming out ahead. Sure the president is “right on principle” as the linked Washington Post peice says, but he is completely wrong on politics. Furthermore, President Obama’s opinion on this matter cannot affect the situation one bit. The president isn’t on the Zoning Board for lower Manhattan. He doesn’t own the property. He isn’t a stakeholder in the neighborhood. His opinion ain’t gonna change a thing. In fact, President Obama’s opinion and the opinion of your Maximum Leader are worth about the same in this “debate.” Neither of us are contributing to the discussion. We are throwing our opinions into the crashing noise of raised voices that passes for debate on this subject. We are just two more voices crying out into the cacaphony. Two more voices that, frankly speaking, don’t need to be heard on this. Of course, your Maximum Leader is a lowly blogger with minimal following and no future in politics short of an armed coup and Barack Obama is President of the United States. He is coming up with the short straw in this game. Your Maximum Leader hasn’t addressed the second question yet. Does your Maximum Leader want a mosque built on the site discussed? When this “debate” first began his answer was that he didn’t care much one way or the other. He sympathized with the many who just didn’t want the mosque so near the World Trade Center site; but in the end he figured out that NYC officials and stakeholders in the project would do the right thing. This brings your Maximum Leader to a issue that has now been simmering in his mind for a year or two. How long are we going to fetishize the whole lower Manhattan area around the World Trade Center site? Your Maximum Leader doesn’t like calling the site Ground Zero. He doesn’t because Ground Zero is a term that can be used in any disaster. He is concerned that at some point in the future people will be upset by some other disaster site being called “Ground Zero.” Sad isn’t it. If your Maximum Leader could point out a few items… The World Trade Center site is very valuable real estate. He should be redeveloped (and is being redeveloped). But many Americans have a maudlin fixation on the site. In the immediate aftermath of the attacks there was a sort of consensus that we needed to get on with rebuilding the World Trade Center site. Now your Maximum Leader wonders if we are going to start objecting to certain uses of the redeveloped space? Would a muslim charity renting office space in a new World Trade Center building be objectionable? Would investment bankers (given their role in the recent economic troubles) be objectionable in that they weren’t a “good enough” type of organization. Should we just build a mega-public safety center on the site and fill it with Firefighters and Police officers? Is your Maximum Leader the only one that worries about this? (Well… When he’s not waxing eloquent over Lindsay Lohan and mastubating furiously Skippy might have some similar concerns. But that could just be your Maximum Leader projecting on Skippy.) We still use Pearl Harbor. Is it “less sacred” than the World Trade Center site? We have built all over Bunker (and Breed’s) Hill? Is that site less meaningful because of it’s continued use? Is it just a question of scale? If more patriots died at Bunker Hill would we have objected to building on and around the site? Your Maximum Leader isn’t advocating that we all forget the attacks of September 11th. Not at all. But at some point we need to take a more practical approach to how we will use the land of lower Manhattan. Greetings, loyal minions. Your Maximum Leader doesn’t have many people he’d consider his personal heros. There are a few however. At the top of that list is Winston Churchill. (Also on that list are George Washington and Elvis. You can see others over on the right side nav bar under the “Pantheon” heading. It’s a conspiracy theory worthy of the “X-Files,” and it goes like this: Churchill, then the prime minister, apparently ordered a cover-up of an encounter between a Royal Air Force bomber and an unidentified flying object during World War II. The reason: Churchill feared that news of the incident would create public panic and a loss of faith in religion. The Daily Telegraph explains that Churchill is reported to “have made the orders during a secret war meeting with U.S. General Dwight Eisenhower, the then commander of the Allied Forces, at an undisclosed location in America during the latter part of the conflict.” He ordered that the information remain secret for a period of 50 years. Apparently, Churchill’s order was overheard by one of his bodyguards. The man, also a member of the Royal Air Force, kept the secret to himself for years, but told his daughter at some point, and told his wife on his deathbed in 1973. The man’s daughter later told her son (the bodyguard’s grandson, for those of you keeping score), and he inquired about the incident with the Ministry of Defense in 1999. That inquiry made it into the files that were made public on Thursday. According to the report, the crew of the plane did manage to take photographs of the UFO, which “hovered noiselessly” near their plane before zooming away. Alas, the photos, if they do indeed exist, were not released. So there it is. In case you are wondering about it, here is the link to the article in the Telegraph that is the basis of the article on Yahoo. Now let your Maximum Leader say that he thinks that the odds of there being extraterrestrial life (in some form) somewhere out in the universe somewhere are statistically rather high. He also thinks that the odds of that life being able to travel the vast distances across space (and time) to come to Earth and stop by without saying hi are pretty much zero. So he doesn’t believe in UFOs - to be clear. So your Maximum Leader doesn’t know what that RAF bomber crew might have seen, or what story might have made its way to Churchill… But in time all UFO stories have been debunked by careful examination. To much time may have passed for this UFO story to be debunked as well. But if we were able to get the all the facts your Maximum Leader is sure that we could sensibly explain whatever it was that those RAF flyers saw. The more interesting question to this story that doesn’t seem to be asked is what exactly Churchill’s advisors might have thought the UFO was and what theories they presented to WSC to make him classify the incident. Where are Agents Muller and Scully when you need them? Your Maximum Leader doesn’t normally blog about his dreams. This is mainly because dreams (Inception aside) are just subconscious ramblings of you mind trying to unwind. Last night your Maximum Leader had a dream that was positively frightening. It did, in fact, wake him from his slumber. In the dream your Maximum Leader’s legs were encrusted with some material like peat moss. The moss was infested with flesh-eating ants that were trying to make a colony in his legs. In the dream after a bit of panic your Maximum Leader took a long knife and cut off the infested moss. He then swam in a very cold river. Apparently at this point he woke up. This was the first time a dream has caused your Maximum Leader to wake up from a deep sleep in longer than he can remember. Oddly… Shortly after waking up a loud thunderstorm blew in. It was comforting and put your Maximum Leader right back to sleep, happy in the knowledge that we were getting much needed rain.